April 6, 2018, 1:12 p.m.
By Laura Hazard Owen @laurahazardowen April 6, 2018, 1:12 p.m.
POSTED April 6, 2018, 1:12 p.m.
Owen, Laura Hazard. "Tweetstorms are better with friends: How three papers are tweeting together over 4-plus days." Nieman Journalism Lab. Nieman Foundation for Journalism at Harvard, 6 Apr. 2018. Web. 25 Apr. 2019. Owen, Laura Hazard. 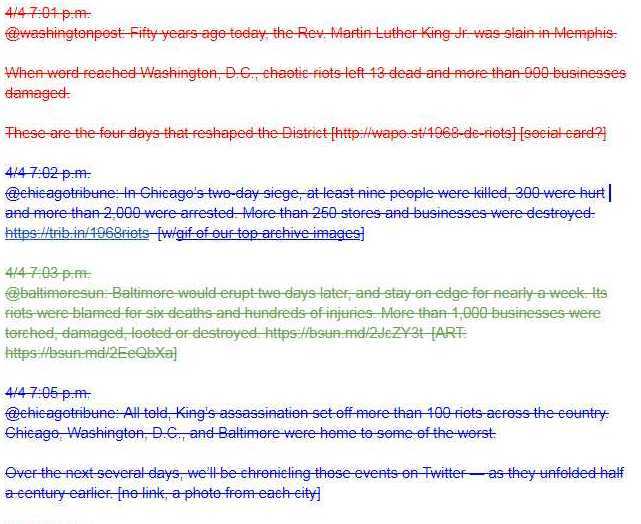 "Tweetstorms are better with friends: How three papers are tweeting together over 4-plus days." Nieman Journalism Lab. Last modified April 6, 2018. Accessed April 25, 2019. https://www.niemanlab.org/2018/04/tweetstorms-are-better-with-friends-how-three-papers-are-tweeting-together-over-4-plus-days/.